Tehran. She met and married her husband, Kourosh, there and together, the pair had two sons. Her husband moved to the United States in 2000, and Maryam and their children followed in 2003. Her older son, Darius, is 27-years-old, married and has a 3-year old son - Maryam's only grandchild! Her younger son, Kia, is 24-years-old and is a medical student living in Albuquerque, NM. He's hoping to transfer to Brigham Young University to continue his studies. Maryam and her husband made a choice to move to the U.S. so they could practice their chosen religions freely. Maryam is a Christian, and her husband is Jewish. While living in Iran, they were always nervous about being true to their own beliefs. As noted above, Maryam's husband immigrated to the U.S. first and was working as an IT consultant for a company that recorded Bible translations in multiple languages. When the company learned that they were separated, their sponsorship allowed the family to be reunited. While still living in Iran, Maryam studied economics but has always wanted to learn more about psychology - a subject she finds fascinating. After relocating to the U.S., she immediately started working as a caregiver. In fact, she started her first job the second week she was here! Fun Fact: When first dating, Maryam told her husband not to be surprised if one day he came home to find "a bunch of old people in the house.” She has always loved spending time with the elderly and caring for older loved ones. Maryam has three top highlights in her life. These highlights include when she became a mother to two, wonderful children (she always wanted two boys, and her prayers were answered). She also notes that having the support and love of her family (and knowing that she is her father's favorite but don't tell her siblings!). Last, she highlights being able to live in a country that lets her be faithful to her own beliefs. As a teenager, she had a raging crush on Robin Gibb from the Bee Gees. Not just regular fan-girl stuff, but full-blown love, complete with wedding plans! Maryam is a lifelong reader of classic romance authors like Jane Eyre. She loves to lose herself in a good story where true love wins in the end. 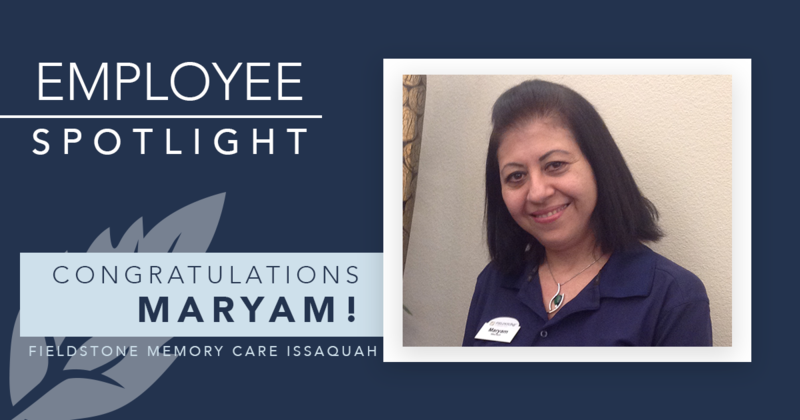 Maryam has been a stellar employee at Fieldstone Memory Care Issaquah for just over one year. She loves everything about her job and being able to spend her days with our residents. Maryam came to Fieldstone Communities as an experienced MedTech, but our training and systems have helped her to broaden her knowledge and understanding of her position. We believe Maryam is genuinely one of those indispensable people we can always count on her to be on time, to do an excellent job, and to see a need and fill it without a lot of drama - every day. At times, it is easy to overlook the value of having her on our team because she doesn't seek attention - but we wouldn't be the same place without her! This is why we selected Maryam as Employee of the Month for Fieldstone Memory Care Issaquah in December 2018. If you would like to learn more about our memory care communities, or any of our Fieldstone properties, visit our website today.